Recorded as Ainsworth, Aynsworth and Hainsworth, this is an English surname. It is locational from either a place now called Ainsworth in the county of Lancashire, or possibly from Hainworth in the adjoining county of Yorkshire. The Lancashire place name is recorded as "Hainewrthe", in the Pipe Rolls of the county in 1204, and later as "Aynesworth" in the Assize Court Rolls of 1285. As surnames began to be created from about the year 1175 it can be seen that either spelling is possible. It would seem that both placenames have much the same origin being from the pre 7th Century personal name either "Aegen or Hagen", probably meaning own, plus "worth", a homestead; hence, "Aegen's homestead". The surname dates back to the early 14th Century (see below), and early recordings include John de Aynesworth, who appears in Baines "History of Lancashire" in 1370, and John Hainsworth in Cambridge in about 1460. Early church registers list the christening of Richard Ainsworth on July 25th 1567, in Winwick, Lancashire, whilst Robert Ainsworth (1660 - 1743) published a much acclaimed treatise on education in 1698, which formed th basis of national education some two centuries later. Locational surnames are by their nature "from" names. That is to say names given to people after they left their original homes to move somewhere else. This action also lead to the development of "sounds like" spellings. 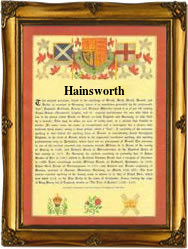 The first recorded spelling of the family name is shown to be that of William de Aynesworth. This was dated 1332, in the "Subsidy Rolls" of Lancashire, during the reign of King Edward 111rd of England, 1327 - 1377. Throughout the centuries, surnames in every country have continued to "develop" often leading to astonishing variants of the original spelling.